Sniffle. It's allergy season again. Do those shots work? Ah, spring is in the air. The flowers are blooming and the trees are bursting into leaf. For many of us, this time of year means one thing: allergies. The price of going outside for any length of time is sneezing and itchy eyes that last for many hours, even after we return indoors. 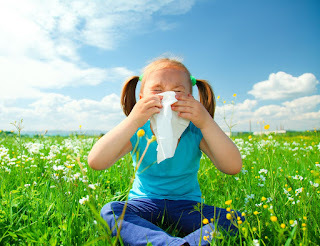 Rather than going out and enjoying the warm air and colorful vegetation, we close the doors and windows and stock up on antihistamines and eye drops. Studies show that 20–40% of people in the U.S. have allergies. "Patients struggle to alleviate their misery, frequently self-adjusting their treatment regimen of over-the-counter and prescription medications because of lack of efficacy, deterioration of efficacy, lack of 24-hour relief, and bothersome side effects." Isn't there a way to tell your body to just stop it already? After all, pollen is not a pathogen. Our misery is caused by our own immune system's over-reaction: it ramps up in response to the foreign particles (pollen) in our eyes and airways and creates a histamine reaction, which is simply not necessary. None of the over-the-counter pills prevent this reaction, but they can dampen it–hence the term "antihistamine." However, what if there were a way to tell your body to simply chill out and ignore the pollen? Well, maybe. You can get allergy shots. This is a surprisingly simple procedure: your doctor takes a small, diluted amount of the allergen (pollen, cat dander, etc.) and injects it into your arm. Over the course of many months, your doctor will very gradually increase the amount being injected. You have to go for the shots every week, and continue them for several years. The question is, do they work? The answer is a qualified yes. "we found high grade evidence that subcutaneous immunotherapy reduces rhinitis/rhinoconjunctivitis symptoms." This might seem like pseudoscience, but it's not: what's happening is that your immune system is being de-sensitized to the allergen. It doesn't work for everyone, but in many people, this gradual de-sensitization trains their immune system not to react so badly. It's not necessarily permanent, either: after stopping the shots, allergies might re-appear after a few years. So if you're looking out your window at the beautiful spring weather with a box of tissues by your side, maybe you have a way out. Talk to your doctor or visit the AAAAI site to find an allergy specialist. Don't expect miracles or a quick fix, but allergy shots are the best we've got, for now. 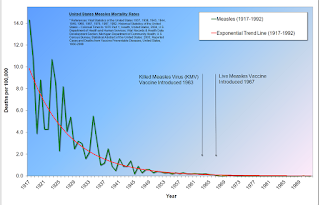 History of measles in the 20th century. For several years now, anti-vaxxers have been claiming that they have religious objections to vaccines. This is nonsense. Just last month, the New England Journal of Medicine featured an article describing how the federal Equal Employment Opportunity Commission (EEOC) has been suing hospitals that deny employee requests for religious exemptions to the hospitals' vaccination requirements. The NEJM documented 14 cases where employees sued claiming that they had religious objections to the flu vaccine. Six of the cases were settled, and in the other cases, sometimes the hospital won, sometimes the employees. It's a mess. The NEJM article focused on the legal perspective, advising hospitals on how they might avoid lawsuits. That's understandable, but it misses the broader point: there's virtually no such thing as a religious objection to vaccines. All of the world's major religions support vaccination, and only a few tiny, extremist sects teach their followers that vaccines are contrary to their faith. What's really going on is that anti-vaxxers are using religious exemptions as cover for non-religious (and erroneous) objections to vaccines. The anti-vaxxers have convinced people that vaccines are harmful, or scary, or both. They are wrong. 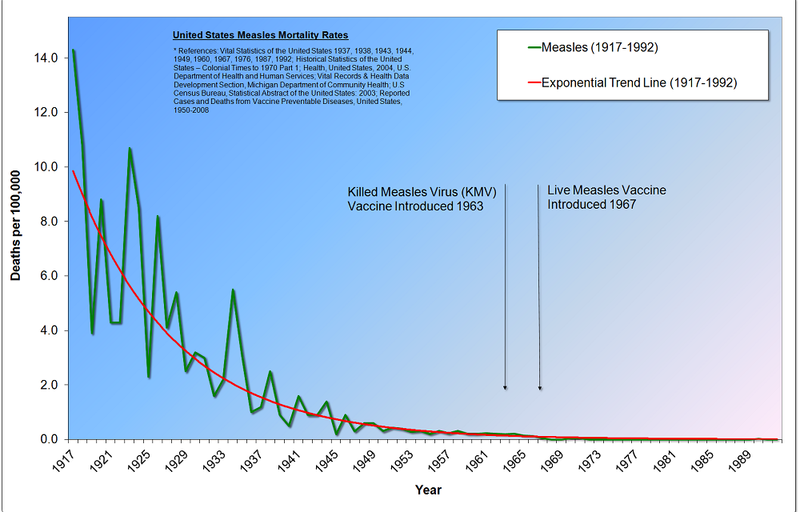 And that's just measles. People no longer suffer and die from smallpox and polio, which have been eradicated worldwide (except for a few countries where polio still has a foothold). Vaccines protect us from multiple other formerly common childhood infections, and they've been so effective that people are no longer afraid of these diseases. That very success is the opening that the anti-vaxxers use to spread disinformation and fear. Here, though, there are signs of hope. After suffering from repeated outbreaks of preventable diseases like measles, many states have recently awakened to the risks caused by unvaccinated children in public schools, and they are moving to remove or tighten these exemptions. New Jersey is the latest state to act. While the bill introduced in the New Jersey legislature last week doesn't quite eliminate religious exemptions, it makes them harder to get, requiring considerably more documentation from parents claiming a religious exemption from vaccines for their children. NJ took action after realizing that these so-called "religious" objections had risen dramatically, from 3,865 in 2009 to 10,407 in 2016. That rise was fueled, apparently, by anti-vaxxers taking advantage of the loophole in the law, not by any genuine religious objection to vaccines. It's worth noting that all states allow medical exemptions to childhood vaccination, which are legitimate and necessary. For example, a child undergoing leukemia treatment may have a severely weakened immune system, and a vaccine would be ineffective and possibly harmful. These children are precisely the ones who can only be protected by requiring all the other children in their school to be vaccinated. Meanwhile, the EEOC should stop suing hospitals. Hospitals are filled with very sick and vulnerable people, and employees have an obligation not to expose patients to possibly deadly infections. If a hospital employee doesn't take that obligation seriously, then s/he should find another job.